33 in stock Need More ? All five episodes from the second series of the BBC drama starring Suranne Jones. 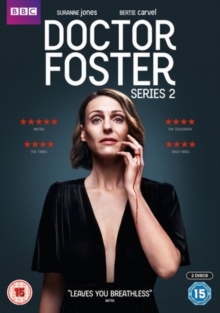 Two years after exposing her husband Simon (Bertie Carvel)'s affair, Doctor Gemma Foster (Jones) is starting to get her life back on track when Simon returns to Parminster with his young, new wife Kate (Jodie Comer) and their child, hoping to once again be close to his teenage son Tom (Tom Taylor). Simon's arrival reignites Gemma's hatred for her ex-husband, making her determined not to rest until she has had her revenge for the rejection and betrayal which ruined her life. But when he tries to take Tom away from her, just how far will Gemma go to get her revenge?